Fourteen weeks along today and baby is still alive. Today's ultrasound was another quick one done with the little bedside machine, which produces VERY poor quality images. Basically all we could see for sure was that baby has a head, a body, a beating heart, and some limbs. The baby did move it's head during the ultrasound, but certainly was not kicking around like it was the last few times. It's hard not to worry about this, even though I tell myself that we only get to look for maybe a minute each week and such variations in activity level are perfectly normal and to be expected. Two more weeks until the very detailed ultrasound. Will we make it that far? It's been nice to at least get a little peek at baby each week and know that the heart is still beating, but on these ultrasounds there's no way to see any details of smaller structures, such as THE CORD, which as you may imagine I am absolutely obsessed about. 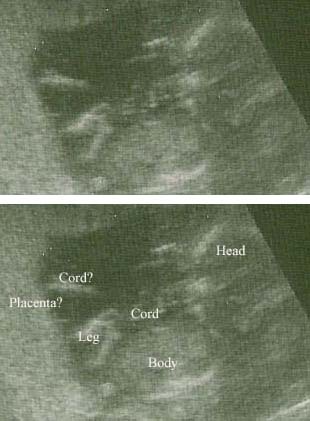 We could barely make out the cord for a couple of seconds today (see below) and although the picture is very bad, I did not like what I saw of the cord located between baby's face and leg because to me it looked like this: / / / / / / Six parallel sections bunched up next to each other. Is this normal? Is there hypercoiling again? Am I just trying too desperately to see some clue about my baby's fate? Told you the image was bad. Of course it's much worse here than it was on the screen at the clinic. These are both the same picture, one left as is so you can get a clearer picture (ha!) and one with parts labeled by me. We still haven't told anyone but family that I'm even pregnant. Mostly, this is because we don't want the kids to know yet and there's no way to keep it from them if other people around them know. My daughter did tell me that I look chubby. My son told me he can't train me to be a Jedi because I'm too fat. I don't know how much longer we can keep it secret. I just don't want them getting all excited about that prospect of a baby (and they WILL be excited!!) only to have the same thing happen again. The other reason for not announcing the pregnancy is that I don't want to hear any gushing from people who have no idea what hell we've been through - "How wonderful that you're "expecting"!" and "Nothing bad could possibly happen now that the first trimester is past!". It's hard enough to keep my own "expectations" in check. I'm not ready to deal with the expectations of others. For me so far the odds have been 50/50. Two kids lived. Two died because of malformed umbilical cords. I had really hoped the odds would be more in our favor this time around with the Lovenox and high-risk care, but I am now convinced it is still 50/50 no matter what we do. Actually the odds at this point are much nearer either 0 or 100 percent as the baby's fate is probably already decided and there's nothing anyone can do about it. The cord is formed - will it give life or take it away? Perhaps it was all decided on November 18 when this child was conceived. We just have to wait to find out whether there is any hope for our baby, and the waiting is pure torture. I've recently been in contact with two women, Cindy and Wendy, who have lost babies at the same time and in the same manner as I have. Perhaps they will share their experiences in more detail later, but for now here are the basic facts: The odds for all of us have been 50/50, and that's not counting early miscarriages. Cindy had four babies live and four die of cord problems. Just like me, she was told to use heparin for each pregnancy after the second loss, but the odds remained the same - 50/50. Wendy had two babies live and two die of cord problems, with the second loss happening just weeks ago and only eight months after the first loss. All three of us first had two successful pregnancies followed by multiple losses. Together we have eight living children and eight dead children, four girls and four boys, who all died in the fifth month of pregnancy. All I can think after comparing our stories is that it must be genetic after all. As I'd postulated in an earlier post, perhaps most cases are caused by a random genetic mutation and therefore very unlikely to recur. But suppose a baby survives despite having a usually deadly genetic mutation that causes malformed cords? That baby would grow up and have kids - then his random mutation gets passed on to his offspring as an inherited mutation. This is what happens in genetic disorders with an autosomal dominant inheritance pattern. 50/50 odds. And so the reign of terror continues . . . two more weeks until we may get a clue which way it will go this time. Will we finally get to dust off the cradle? Of will it be another grave? And how could I possibly go on if it is the latter? Annie these is all so foreign to me...I read some of your side article but am still perplexed...Seems as if they dont really have a ton of research out on this issue....and I know you are stressed out and dont want to ask questions right now about it but guess Im just trying to understand once you are past 20/21wks is it either there is an issue and no fix or its normal...Is that how it works? I know for me with my blood clotting disorder that the have been doing the doppler flow to make sure the cord blood flow is good and strong because if numbers change I know delivery ASAP is the only tx...I know this is nothing like what you are talking about but after 20wks will they monitor the cord even if there seems to be no cord structure issue? I hated when we had to tell everyone about my pregnancy (at 14 weeks). We were still very cautious about it and I couldn't stand the fact that everyone else seemed to totally forget what we'd been through (which isn't nearly as bad as what you've been through). Wow, I can't believe you were able to find Wendy and Cindy - so similar. Not that you'd ever wish your losses on anyone else but the support must be nice. Two weeks huh? Siiiiigh. I REALLY hope that you get the good odds this time...fingers and toes crossed for an uncrossed cord. I'm so glad to hear things are progressing well so far, but totally understand your apprehension and why you don't want to tell people who have no clue. Hang in there hun--hoping and wishing for the best for you. I understand you wanting to wait to share your news. I'm hopeful that everything is going to turn out great with your pregnancy. Oh Annie...I can feel your angst through your post. I can't even imagine the daily obsessive thoughts you're dealing with, and I'm glad you've put off telling people at least to save yourself that extra stress for now. Thinking about you....seems you have a LOT of people sending out positive vibes into the universe for you. I can understand your apprehension and I wish I could think of something to say to give you peace of mind. The image is so blurry that I can't make very much out of it. Try not to read too much into it. I know that may be easier said than done but worrying yourself sick won't help. I'm sending positive energy your way! !